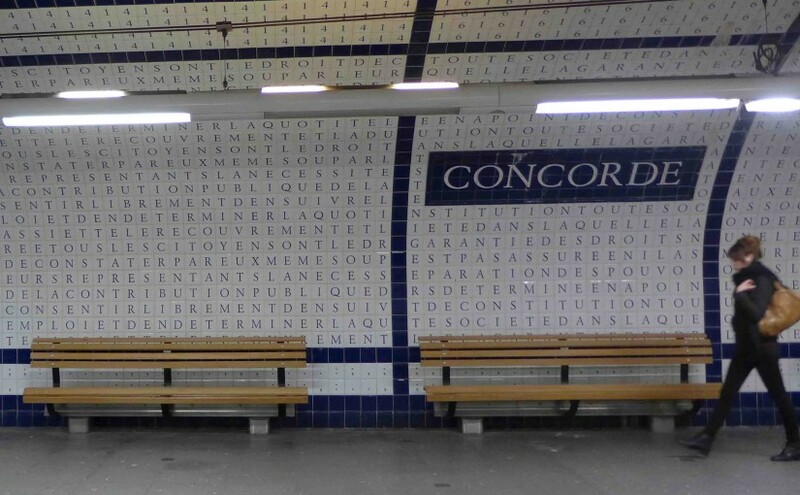 After Bastille in September my Metro Station of the Month is Concorde, which is also a very busy station where one can take three different metro lines. The platform that is worth seeing is located on metro line 12 (Aubervilliers Front Populaire – Mairie d’Issy): do not take the wrong line! I have thought that it makes sense to come from the mural painting representing the storming of the Bastille to the ceramic tiles telling the Declaration of the Rights of Man and of the Citizen of 1789 which ornate the walls of the Metro Station Concorde. This work of art was made in 1991 by the Belgian artist Françoise Schein, who is also famous for the design of some other metro stations in the world (in Brussels, in Berlin, in Rio de Janeiro,…) on the same theme of the Human Rights. I do not mind waiting for a train on that platform as my favourite pastime is to reconstruct the words and the sentences of the Declaration: Indeed each white ceramic tile is decorated with one blue letter and the letters and the words follow each other without any space or punctuation mark! One can let several trains pass before having reconstructed and read the 17 articles! Back to earth: Do not miss the ‘Place de la Concorde’ of course, which got its name in 1795 to celebrate the national reconciliation after the French revolution (and gave it to the metro station) and is the most majestic square in Paris. And at that time of the year I would recommend three activities in the immediate surroundings: A visit to the Jeu de Paume to see the photography exhibition dedicated to Philippe Halsman; the Ferris Wheel on the Place de la Concorde which offers amazing views on Paris; and of course a night walk on the Champs Elysées to admire the Christmas lights! Next Next post: The New Musée Rodin in Paris: So Beautiful!